Systemline goes wireless for multiroom | What Hi-Fi? 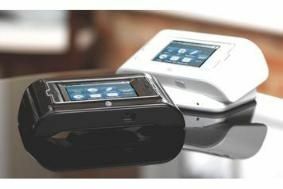 The Systemline Wireless Touchscreen is made up of three components. There's the Touchscreen itself, which is battery operated, and can be used constantly for up to four hours before a recharge. It's available in gloss black or white, and comes with its own charging base station (in matching colour) and a Systemline wireless junction box. Inside the Touchscreen controller is the Systemnet control software that allows it to communicate wirelessly with up to eight zone receivers. Systemline has just released the latest version of Systemnet, v12.0, which now includes two-way RS-232 control of AV products, starting with the NAD AV receiver range. And the wireless junction box is connected directly to zone cards in the S6 controller allowing communication from multiple wireless screens. You can buy the Wireless Touchscreen Controller in black or white, with the charging base station and wireless receiver, for £850. The base station can be bought on its own for £130, and the wireless receiver for £225. All Systemline products are distributed in the UK by Armour Home Electronics.